Apple’s new iPhone was arguably the most anticipated device launch of 2014. After a rumored-filled year, the iPhone 6 is here. As expected, the iPhone is to be released in two different models. 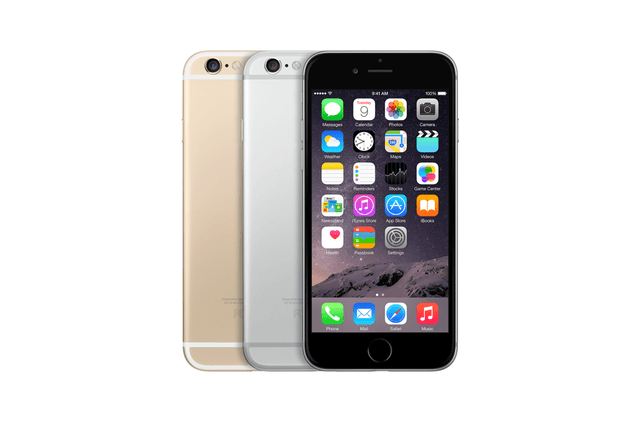 The baseline iPhone 6 has a 4.7-inch screen and the larger iPhone 6 Plus, is a 5.5 inch phablet. The devices are available for preorder on September 12, and ship on September 19. Aside from all that hype, we want to know how the iPhone 6 stacks up against other popular devices from 2014. 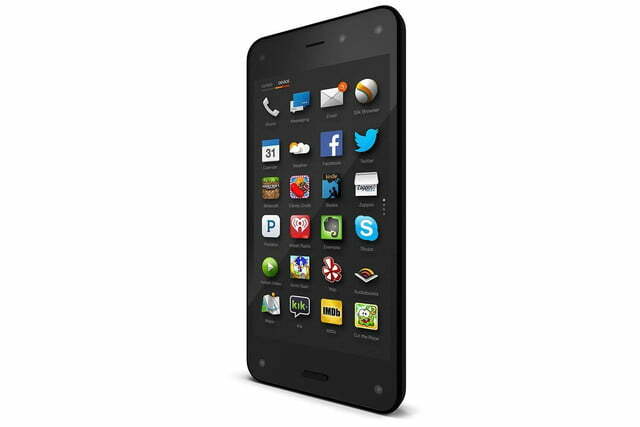 We’ve pitted it against one of the most intriguing phones of 2014: the Fire Phone from Amazon. How does the new iPhone compare? See for yourself. Apple’s A8 processor is reportedly 25 percent faster than the A7 processor found in the 5S and has 50 percent faster graphics performance. Back when the 5S debuted, it blew every every other phone out of the water in speed benchmarking tests. Fire Phone’s answer to Apple’s 64-bit architecture was adding 2GB RAM (compared to anticipated 6’s 1GB). Despite 2GB of RAM, Fire Phone’s beating heart is the quad-core Snapdragon 800 processor– a slightly antiquated processor — that has a reputation for being a bit of a battery hog and can lag, especially under heavy use. The iPhone 6’s 64-bit architecture has its benefits and will likely be a more powerful device. Whether the moderate upgrade in processor on the iPhone 6 will improve the already snappy speed is yet to be seen. Apple bundles the A8 processor with an M8 co-processor that pairs well with fitness apps and includes a barometer. Even so, the Fire has a significantly longer battery life at 22 hours of talk time (though you might not have any power left after a day of heavy use). The Fire Phone does have some nifty features including a Mayday button — which allows you to summon a remote support specialist in seconds — and Firefly — a device that detects real-world objects and pulls up corresponding information online. It’s worth mentioning that Fire Phone doesn’t work with Google apps. Like, not at all. It’s a major setback. Yes, there are workarounds. But Fire Phone’s Nokia Here is a disappointing replacement for Google Maps. It appears that bigger is better, these days. The iPhone 6’s screen grows to 4.7 inches with a resolution of 1334 x 750 pixels. It matches the display size of the Amazon Fire Phone, but it has a slightly better resolution and lower weight. Major design changes for the iPhone come in the form of the power button that has moved from the top to the right-side of the device and the camera, which protrudes slightly from of the back panel. The obvious advantage is that you’re less likely to get smudges on the iPhone 6’s camera lens. We cited button location as a design flaw of the Fire Phone. The volume button sits too close to the camera button, and we found that we would occasionally trigger the camera when we tried to turn the volume down. The iPhone chassis is also updated with slightly rounded edges, as well as an overall thinner and lighter design. It offers better grip than the Fire Phone’s rear glass panel, which is akin to that of the iPhone 4S, in that it does occasionally “phantom slide” on table tops. The iPhone 6 will initially be offered in the same color options as the 5S: gold, black, and space gray. The Fire Phone comes in one color: basic black. It’s also worth mentioning that the Fire Phone doesn’t have a back button. While the iPhone can get a way with it, the Fire Phone does occasionally have some apps that lead to dead ends. The iPhone 6 will see small camera upgrades. A 2.1-megapixel camera replaces the 1.2-megapixel “face time camera” of the 5S. However, we all know that megapixels aren’t the only thing that determines the brawn of a camera. The newest iPhone doesn’t boast any higher resolution with the rear camera, touting a nearly identical 8.1-megapixel. Still, Apple announced that the 6 will include iSight, which should allow the iPhone camera to take better pictures. iSight comes with a slew of features that help improve photos, including updated face detection and exposure control, as well as apps that allow you to better edit photos directly from your phone. It can also produce 1080p HD video that can capture 60 fps for a better slow-motion picture, and betters the Fire Phone in this category. The Fire Phone packs nearly twice the pixels into its rear camera, coming in at 13 megapixels. It also adds Amazon’s quirky-but-functional Dynamic Perspective that uses 4 infrared cameras to sense your face and then can adjust the perspective of certain images to give the impression that you can see objects from multiple angles. Amazon also offers unlimited photo storage on their cloud. It’s an appealing service, considering iCloud only gives you the first 5GB free. Even though the fire Phone has some cool features, the iPhone 6’s camera will most likely be the superior shooter. The iPhone 6 is available for preorder September 12. The actual phone will ship September 19. The iPhone 6 starts at $200 for 16GB, $300 for 64GB, and $400 for 128GB. Apple products have never had a reputation for being cheap. Lots of similar Android devices, including the LG G3 will give you similar specs for less money. The Fire Phone is available on AT&T. The 32GB phone originally cost $200 with a contract, though AT&T has dropped its price to $1 with a two year contract. The phone does comes with some perks. Most notably an Amazon Prime membership and unlimited storage space for all those photos. 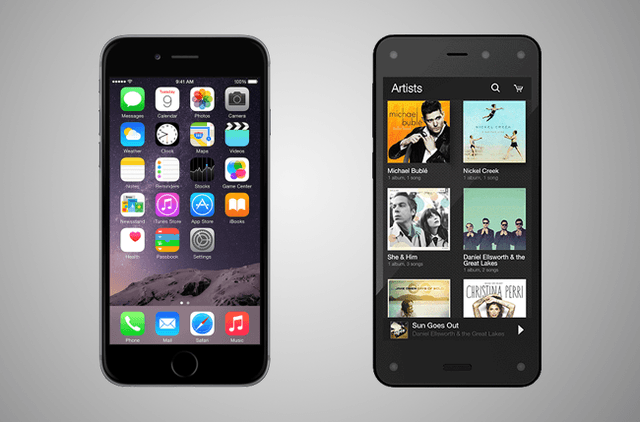 On paper, the iPhone 6 betters the Fire Phone. It preforms better, the resolution is clearer (if only by a little), the connectivity is superior, and the operating system is smoother. However, Amazon’s Fire Phone finds its legs in this competition with bonus features. While not revolutionary or groundbreaking, the way in which the Dynamic Perspective and Firefly technology benefits users could be the kindle for a terrific device a few years down the line. 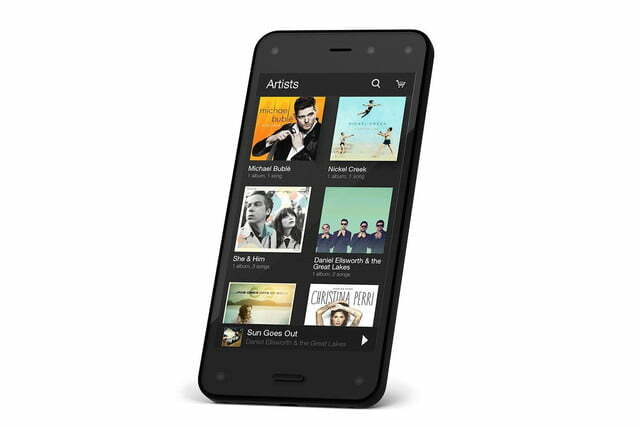 If you want unique features, quick access to Amazon Prime, and a nearly free device, check out the Fire Phone. 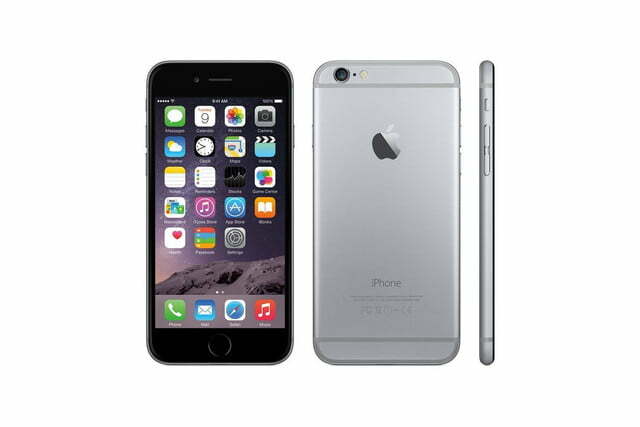 However, the iPhone 6 is undoubtedly the more powerful of the two, and the growing Apple ecosystem makes the iPhone a superior product. Related: iPhone 6 vs. iPhone 6 Plus. Related: iPhone 6 vs. Galaxy S5. Related: iPhone 6 vs. Sony Xperia Z3.